Shop for tubs at Tubz.com. Find soaking, whirlpool or air tubs with factory direct savings. Call us! 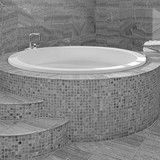 We are the experts and will help you find the perfect bathtub to fit your bathroom style and won't put a strain on your budget. There is nothing more tranquil that lying in a comfortable bathtub, soaking away all your worries. And if you are looking for more than a soak, we offer massage tubs: whirlpools, air and even massage. Each of these system tubs come with options to create the custom tub of your dreams. Below you can shop for your bathtub by size or by style. 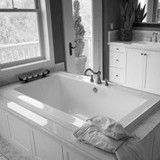 Most of our tubs are offered as a soaking tub, whirlpool, air & as a combination tub. As you explore the different baths by size or style, there will a list showing the systems offered for each tub. 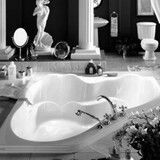 While we are discussing dreams and tranquility - we want you to have peace of mind with your tub purchase. We have a large selection of quality tubs listed on our site which can feel overwhelming as you shop through them. Just call us: we have been doing this for so long we have become tub experts. We work closely with our manufactures and pride ourselves on our product knowledge. 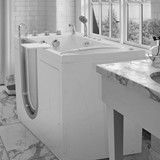 Our experts are here to answer all questions and guide you through your tub selection. We mentioned a large tub selection above. Why do we carry so many brands? So we can offer a large selection of shapes, sizes and installation styles. To provide options on whirlpool, air or massage systems. 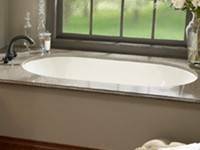 To ensure that we can find the bathtub that fits your bathroom space, creates a beautiful focal point and provides for your bathing needs. 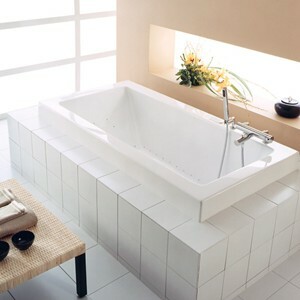 Our bathtubs come to you directly from the manufacture. We pass those savings on to you. Each tub is created at time of order and carries the manufacturer's full warranty. Many times the manufacturer's list price is given. If this is the case, drop us an email or give us a call so we can discuss fantastic sale prices. We offer free shipping (48 Contiguous States) on all our tubs. 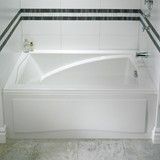 An undermount tub requires a flat rim. It can be any bath shape. The bath edge is under the deck material making the rim of the bath invisible. Make sure to order as an undermount so the electronic controls will either not be installed or installed in a location that won't interfere with the under mounting. A drop-in bath can be any shape. A deck is created (with an opening in the center) and the bathtub is dropped into the surround. The tub sits on the bathroom floor (not hanging from the rim). The size of the deck is a matter of preference. A lot of pictures will show a wide deck, which can look beautiful, but others don't have the room for a wide tile area. Perfect for Tub/Shower Combinations - An alcove requires a rectangular bath placed between three walls. A skirt hides the underneath of the bathtub in the front. The skirt can be integral to the tub - all one piece. Other skirts are removable or have removable panels to provide access to equipment. There is also the option of creating your own tile or wood front skirt. Freestanding bathtubs are installed away from the wall, even in the middle of the room. They are skirted on all four sides and come in a variety of styles and materials. Soaking, Whirlpool or Air Bathtub?